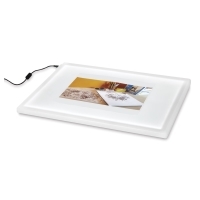 The Copic Tracer LED Light Box provides instant on and off with no light flicker, as well as a cool work surface. 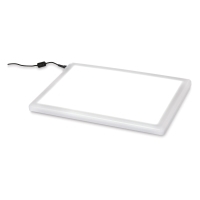 Plus, this ultra thin and portable unit easily fits in a portfolio or briefcase. Built with solid state LED technology, the Tracer features smooth, rounded edges that eliminate creases in your materials and provide comfort for your hands and wrists. With zero bulbs to be broken, it withstands the rigors of everyday use. The Tracer's LED lights are rated to last up to 50,000 hours.